A Rinkya Blog: X Japan Reunion Concert Sold Out! The much anticipated reunion concert of X Japan sold out through pre sales before the official sale dates began. The X Japan reunion concert is March 28th and March 30th at Tokyo Dome. Due to the unexpected sell out of pre sale tickets, they are looking for ways to increase seating and will auction off premiere seats where part of the proceeds will go to charity. As soon as these premier tickets of this rare concert go on sale, we will announce on Rinkya! The band's newest song, I.V. can be heard during the movie Saw 4, although it is not included on the soundtrack. I.V. did top I-Tunes daily charts, making X Japan the first Asian artist to do so! 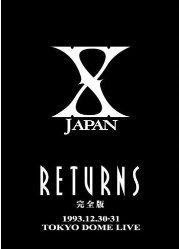 On February 29th, they will release a DVD Box set- "X JAPAN RETURNS" available for preorder here! Order via Rinkya Stores today to get your hands on the DVD release!